Our dive flag pendant has attractive, durable chip inlay of simulated red coral and mother of pearl, set into Rhodium-plated bronze or brass. Rhodium is a rare, silver to white metal that belongs to the Platinum group of metals. It is about 10 times more costly than gold, but because it is a "noble metal" and inert, it will not tarnish and makes jewelry more durable. Use of simulated inlay in Dive Flag Jewelry protects our reefs! 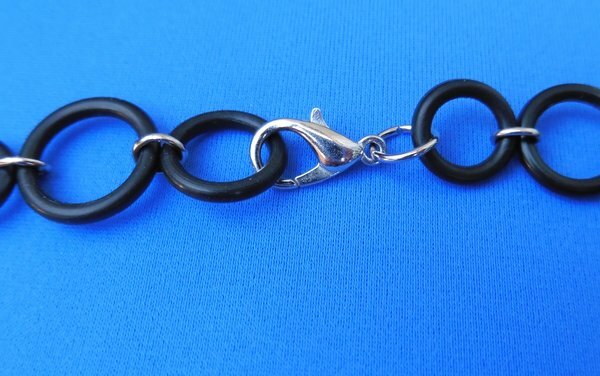 The dive flag is part of a bracelet made of O-rings, those simple rubber rings that, when it comes to SCUBA diving equipment, are used to keep the water out and the air in! 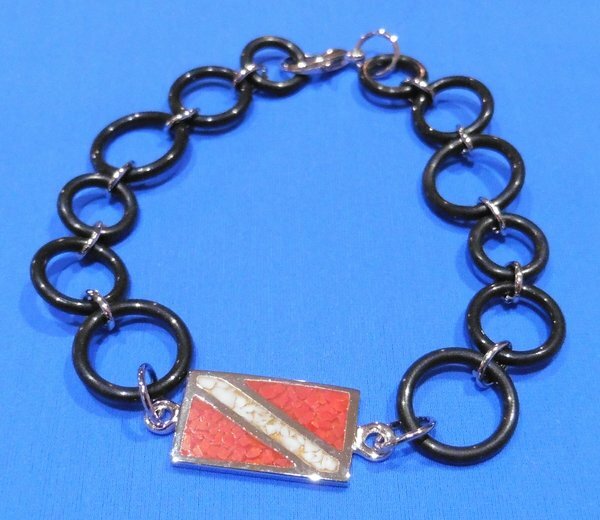 This bracelet is 7" long, which fits most ladies' wrists, and has a rhodium-plated clasp. Flag dimensions: width 11/16", height 7,16", thickness 1/16"